When it comes to Australia Day ambassadors, sport heroes seem to be favourites for Macarthur and 2019 is no exception. Paralympic athlete, global adventurer and accessibility advocate Nicholas Gleeson will share his inspiring story with the community this Saturday as Campbelltown City’s Australia Day Ambassador. And over at Camden, former marathon swimmer Susie Maroney will be their 2019 Australia Day ambassador. When Wollondilly is taken into account, it’s a case of two out of three – Ralph and Kathy Kelly, founders of the Thomas Kelly Youth Foundation, will be the southern shire’s Australia Day ambassadors for 2019. The couple, who lost their eldest son Thomas in tragic circumstances in Kings Cross in 2012, will be special guests on January 26 in Picton’s Botanic Gardens. But what all three ambassadors share is a determination to succeed in the face of overwhelming odds – a trait as Australian as the Akubra hat. Nicholas Gleeson, who has been blind since age seven, will attend Campbelltown’s official Australia Day ceremony at Ingleburn’s Greg Percival Community Centre on Saturday from 9am. “I am looking forward to welcoming Mr Gleeson to our city on such an important day as Australia Day,’’ said Mayor George Brticevic. “Over many years, Mr Gleeson has built up a reputation as a motivational speaker and I am sure everyone in our community will gain inspiration from his life story of overcoming adversity and the challenges of living with blindness,’’ Cr Brticevic said. Born in the Melbourne suburb of Broadmeadows, Mr Gleeson, pictured, was seven when an electronic swinging supermarket door collided with the side of his head, causing a retinal detachment. 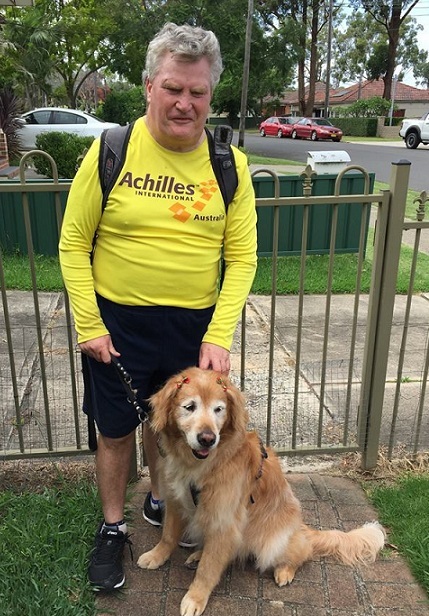 Mr Gleeson has not let blindness stop him from achieving his dreams, and his achievements include reaching the summit of Mount Kilimanjaro, trekking the Simpson Desert, climbing to Everest base camp, running the New York Marathon three times and representing Australia at the New York Paralympics in 1984. Mr Gleeson has also played blind cricket (which is similar to the traditional game, but using an audible ball) for almost 20 seasons. He attended a boarding school for children who are blind and went on to complete a Bachelor of Arts at Melbourne University. Despite his academic achievements, Mr Gleeson’s great passion has always been sport and adventure. The youngest of seven children, Mr Gleeson’s brother Maurice also became blind at age 13 while another brother Russell, died at age 23. Susie Maroney is best known for winning the Manhattan Island swim race three times as well as being the youngest and fastest female to swim the English Channel aged 15 years. Mayor of Camden, Cr Peter Sidgreaves said he was looking forward to meeting the champion on Australia Day. “We’re honoured to have such a champion visiting us as our Australia Day Ambassador for 2019,” Cr Sidgreaves said. A fun-filled Australiana street party will be the centre stage of action at Camden’s annual Australia Day event. The event will offer something for everyone to enjoy, from a show-stopping street parade that includes a variety of floats, semi-trailer trucks and vintage cars, to a thong throwing competition, cork hat and koala cupcake making workshops, kid’s entertainment and live music.